Edwin Elliott's father was Edwin Litchfield Elliot. He was educated at Magdalen School in Oxford then, in 1869, he entered Magdalen College of the University of Oxford to study mathematics. After outstanding achievements at university, Elliott became a Fellow and Mathematical Tutor of Queen's College, Oxford, in 1874. In addition to his Fellowship at Queen's College, Elliott was appointed a lecturer in mathematics at Corpus Christi College in Oxford in 1884. These appointments came to an end in 1892 when Elliott became the first Waynflete professor of Pure Mathematics. This chair was named after William of Waynflete, the English lord chancellor and bishop of Winchester who founded Magdalen College in the 15th century. The Waynflete chair came with a Fellowship at Magdalen College so Elliott was again attached to his old College. One year after being appointed to the Waynflete Chair of Pure Mathematics, Elliot married Charlotte Amelia Mawer. Elliott's mathematical life circulated round the twin foci of Oxford and London. Besides his work in formal teaching and lecturing at Oxford, he was one of the founders (1888) of the Oxford Mathematical Society, its first secretary, and later its president. His mathematical work included algebra, algebraic geometry, synthetic geometry, elliptic functions and the theory of convergence. 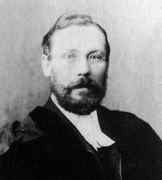 However his most important contribution was the book An introduction to the algebra of quantics which was first published in 1895. This work was a major contribution to invariant theory. In the book Elliott presented a wealth of material on invariant theory which had been developed on the Continent of Europe, but he presented it in a style which was more familiar to English mathematicians familiar with the work of Cayley and Sylvester. It was a popular book and, in 1913, Elliott published a second revised edition. As a teacher he found his chief satisfaction in being of use to others, and was unsparing in his help and encouragement, not only of his more promising pupils but to some very poor mathematicians. All ageing mathematicians should be particularly pleased to learn that a second piece of work by Elliott, which was again of major importance, was his contribution to the theory of integral equations which he made after he retired. In fact he was aged 77 when he produced these important results. ... like all good mathematics .. distinguished by simplicity and naturalness, surprising results being often achieved by the exploitation, with real insight, of ideas in themselves elementary. Elliott wrote well and he always produced clear rigorous arguments. He could not abide sloppy mathematics and anyone producing hand-waving proofs was likely to be severely criticised by him. He was not only critical of others, in many ways he was his own hardest critic. Outside mathematics, Elliott had many interests. Music, natural history and literature were all high on his list of hobbies. However these were often more than mere hobbies. For example he founded the oldest literary society in Queen's College. ... modest and retiring, hesitant in speech, unfailing in helpfulness to others, a much loved man.